Welcome and congratulations on finding my blog! You’re probably wondering why I’ve gathered you all here. Well, for starters let me introduce myself. I’m Jen, a postgraduate international student at Durham University or at least I will be from the end of September. Now I would never say that choosing to go to graduate school in a foreign country is ever a whim, but my decision to go to graduate school in a foreign country was kind of a whim. After four years of teaching music in public schools I finally decided it wasn’t really the career for me. I loved working with my students, especially my chorus kids, but there were a lot of other things that went along with the job that really took away from the fun aspects. I also found it incredibly difficult to get back into the swing of things after having two months off during the summer. (Yes, I know not many people would complain about having summers off, but this is the internet and you’ll find people who complain about bright sunny days and puppies, often in the same sentence.) It was time for a new career, one in which I could feel happy, fulfilled, and have some continuity. So did I decide to get my MBA or go into economics? Perhaps law school or medical school? No, no. Don’t be silly! Why would I choose a lucrative career path? I decided to go into museum science. Well you’re right. The US has tons of museums, over 15,000! And there are roughly 150 graduate level programs in the US in museum studies. So, why England? My answer: why not!? I’ve always been a bit of an anglophile. I began watching Doctor Who before the age of seven. (Tom Baker will always and forever be my Doctor.) British television shows were a constant fixture in my house growing up and to this day I’m still better at recognizing British actors than American actors. Okay, no, that doesn’t make me an expert on British life and culture, but it certainly planted the seed of wanting to visit England someday. Later on I met some wonderful British friends and we would frequently discuss the similarities and differences between life in the US and the UK. I enjoyed listening to their stories and one day I asked one of them if she thought I would enjoy living over there. “Oh, yes. I think you’d really love it,” she said. Then there is the wanderlust. Now I will freely admit it hasn’t taken me very far . . . yet. I’ve mostly traveled around the US with one two week jaunt down to Brazil. Though I haven’t had a chance to travel the world as extensively as I would like, I do have an explorer’s spirit. I find I am often happiest when I am exploring a new place, trying a new activity, or meeting new people. Travelling tends to bring out the hidden extrovert in me. I am more open and adventurous when I am somewhere new. To make a long story short (too late) I chose to look for graduate programs in England because I wanted to experience a different country; one for which I already had an affinity and one which I thought would be a good fit. Also the timing was just right. I had just lost my job and wanted to change careers anyway. I didn’t have any ties to sever and I had a strong support system (and still do) in my friends and family. So one night, I took the plunge and began looking for the right program across the pond. That was a little over a year ago. I was accepted by Durham University in July of 2012. Since then, I’ve been preparing, filling out forms (endless forms), and dreaming about what it will be like once I finally get there. I still have never visited England, let alone the town I’ll be living in, but I’ve been “cyber stalking” the town of Durham on Google maps, looking at Market Square, Durham Cathedral, the Castle, the River Wear, and trying to get my virtual bearings of the town. I’ve begun rooting for Newcastle United in the Premier League and have discovered what is must be like to be a Phillies fan in the process. I’ve been planning out all of the destinations I want to visit on my holidays from school: London, Stonehenge, Highclere Castle, Cornwall, Hadrian’s Wall, the Doctor Who Experience in Cardiff, 221B Baker Street, the list is ever growing. I’m not sure I will see everything and do everything I would like to and at times I have to struggle to remember I’m there to earn an advanced degree and not to be a tourist. Whatever my year in England will be, I’m sure it will be unforgettable. I hope to share my experiences, discoveries, disappointments (hopefully there won’t be many of those), excitements, and not a few photos with you. So if you like what you are seeing and what you are reading, please come back and see how I’m getting on! If not . . . well then, I’m really sorry . . . hmmm this is awkward. 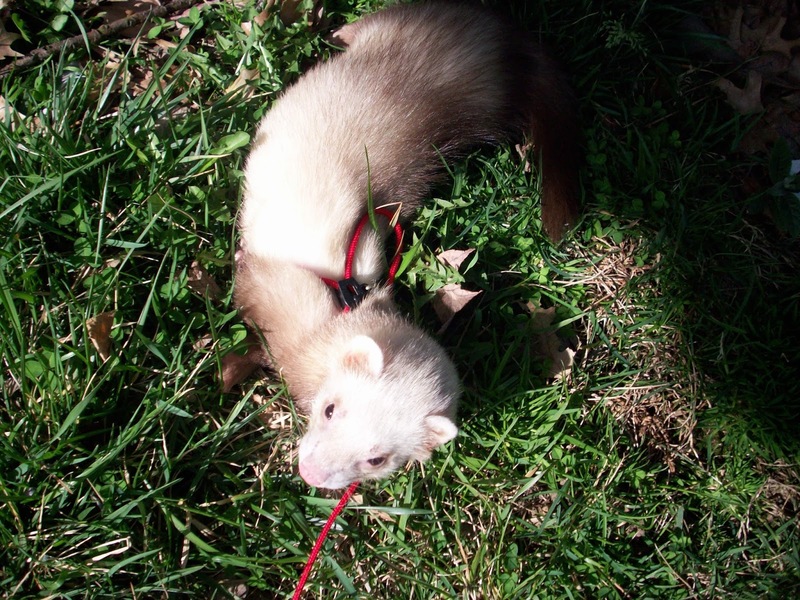 Here have a picture of a ferret so your five minutes weren’t completed wasted. Are you bringing your ferret to England? Are they illegal there? Can't wait to stalk you on your blog! In any case, thrilled to find you here! Jen, I love this account of your decision! keep up the blog … fun reading. Your Mom and I are happy that the Red Sox are going to the World Series.